This annual report summarizes NAPD’s 5th year. NAPD started as a group of 40 members sitting around a single conference table in Dayton, OH. This group of leaders imagined an association focusing only on public defense; one that provides relevant resources to lawyers and public defense professionals, one that serves both heads of offices and line advocates, one that cultivates a new generation of justice leaders, and one that would unite and inspire a national community for public defense. Five years later, just shy of 20,000 members in 24 statewide programs, more than 100 county-based programs and with hundreds of individual members, NAPD is settling in. The initial vision has become reality. No longer an experiment, NAPD is on firm footing with an impressive archive of deliverables, a sustainable financial structure, an outpouring of contributions from its members, exciting ideas for the future, and foundational principles to ensure that we stay the course from that original vision. In 2018, we significantly expanded the resources and opportunities for collaboration for investigators and social workers/sentencing advocates in public defense. We brought national attention to local systems through amicus support, technical assistance, National Public Defense Week, letters of support, mentorship, and media commentary. With our partners, we participated in projects about our most critical issues: workloads, juvenile defense, risk assessments, rural justice, mental health and implicit and institutional bias. NAPD is affordable, on-point, and in touch. We pride ourselves on our grassroots organization, our belief in the value of every member, and our ability to nimbly keep up in fast-changing times. We are proud to be able to speak frankly about the issues as we perceive them, and to honestly articulate our client’s perspective as they perceive failures in the system. Sometimes simple truths cannot be stated plainly, given the rampant political interference and inherent racial injustice that plague our systems. We believe that there is real value in being able to acknowledge simple truths, humbly and honestly, and without fear of personal retribution or retribution passed down to our clients. 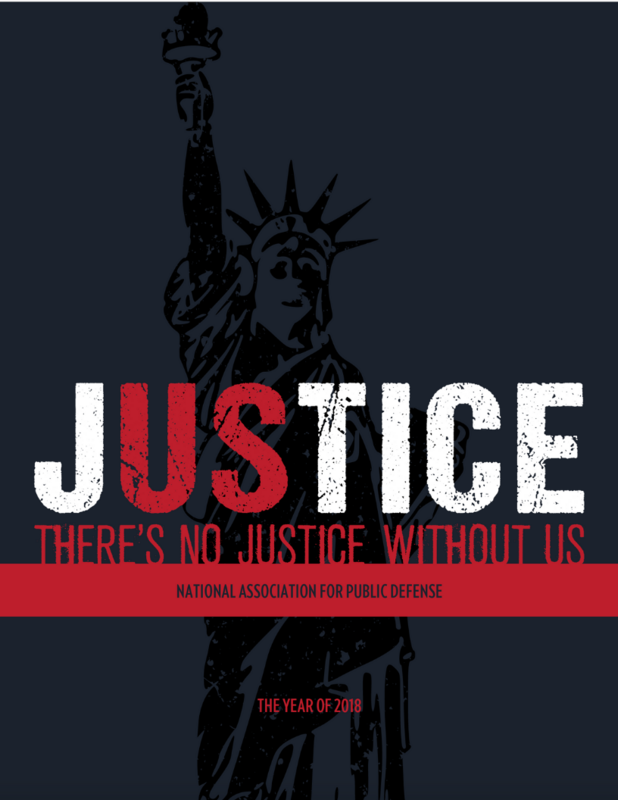 We are the National Association for Public Defense; five years in, we’re here to stay. We’re the defenders, and there’s no justice without us. 2017 marked the 4th full year that NAPD has been in existence. There were big milestones; there were small – but meaningful - connections. NAPD picked up another 20 organizational members, swelled to nearly 16,000 members, set a record for webinars offered, added a live Workloads Conference to its annual Executive Leadership Institute, launched a Mentors Program, grew its committees and their activities, lent its support to dozens of jurisdictions in a variety of ways, and continued to foster a national community of public defenders and public defense professionals. An investigator in Montana got help from an investigator in Florida via the NAPD-investigators list serv. A social worker in Knoxville shared her comprehensive academic review of every single social worker program with NAPD's MyGideon library. In the middle of the night, a line defender in Ketchikan, Alaska found a webinar to help his preparation for trial in the webinar archive. Leaders got shout-outs for advancing reform. A group of communicators began to plan a conference for their unique professional niche. There were robust discussions on the merits of risk assessments. Trainers talked about effectively confronting implicit bias in their offices. More than 100 people blogged for NAPD, writing about their various experiences as defenders, the impact of court rulings, mainstream media's treatment of high profile crimes, achievements, or troubling trends. Increasingly, the media and social science researchers called NAPD for the defender perspective in justice issues. 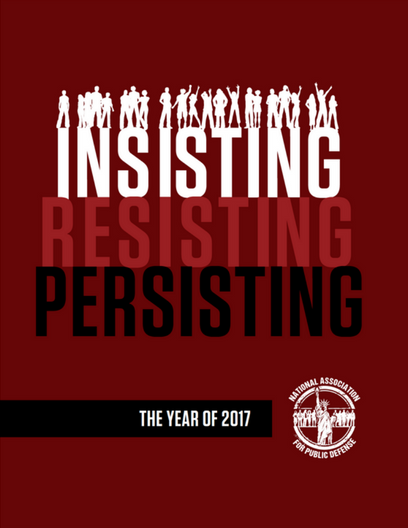 Throughout 2017, NAPD again insisted that public defenders are the experts on public defense issues, and essential participants in a fair and efficient justice system. NAPD resisted strategies used to undermine strong public defense programs and harm our clients, and by extension, communities - particularly communities of color. Finally, NAPD persisted in its efforts to obtain more defender resources, to enjoy the freedom to be zealous advocates, to advance data driven policies, to engage our clients and the client community in the justice movement, and to share the best of what others have done for improvements across the country. report chronicles the scope of services that public defenders provide and the incredible impact that the public defense function has on individual lives and the community at large. Public defenders are at the very center of America’s increasingly public confrontation with racial prejudice, poverty, and the deeply dehumanizing experience of mass-incarceration. ry confinement practice that led to the death of Kalief Browder, who killed himself after spending 2 years in isolation in pre-trial detention on Riker’s Island before his case was dismissed, and to raise the age so that no child is subjected to prison’s harshest environments. Without public defenders in Orange County, the District Attorney’s and sheriff’s wide-ranging ethical breaches would have continued to deny justice to thousands of poor people just as they had for the last 30 years. In most jurisdictions, between 85-90% of all criminal defendants are represented by a public defender. In this relationship so many of America’s socio-economic ills are exposed.The public defense professionals who daily deliver the right to counsel in the courts, jails and their client’s communities are criminal justice experts, and the most committed and qualified entity to lead the movement to bring justice to a broken system. 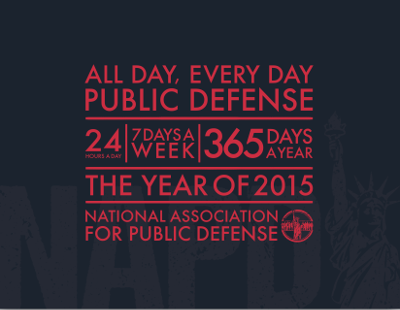 In 2013, contemplating the state of public defense five decades after the Gideon ruling, NAPD formed in order to involve all public defense professionals in a campaign devoted exclusively to public defense. Beginning with 30 members at a meeting in Dayton, OH, the National Association for Public Defense (NAPD) recruited nearly 10,000 lawyers, investigators, IT staff, social workers, paralegals, administrators, and advocates in its first year of operations, tackling the most urgent public defense issues affecting defenders, advocates and clients today. Below is NAPD's 2014 Annual Report, which details a summary of the experiences and accomplishments of its first year, largely told through the voices of the membership. NAPD's inclusive, sharing, practitioner-led organizational model is a unique approach to overcome the challenges that public defenders and their clients face in their quest for justice. 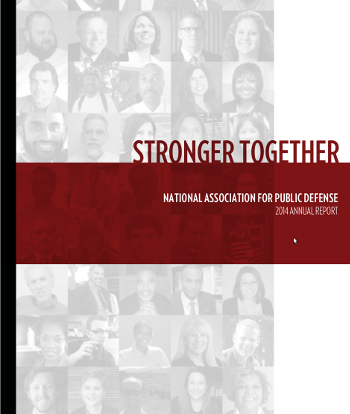 Stronger together, NAPD is overcoming the historical isolation of public defense programs and building a unified, informed community that leverages the intellectual capital of its thousands of members into tools for public defenders to lead the movement for justice reform.